Jesse Eisenberg and Kristen Stewart are preparing to fight law enforcement agents as they determinedly set out to protect their freedom in the home release of their action thriller, ‘American Ultra.’ The comedy, which is now available on Digital HD, is set to be released on Blu-ray Combo Pack (plus DVD and Digital HD), DVD (plus Digital) and On Demand tomorrow from Lionsgate Home Entertainment. In celebration of the film’s new home release, Shockya is exclusively hosting a clip from the movie’s theatrical press day. The video, which is titled ‘Training for Action,’ features the movie’s two lead actors discussing how they rehearsed for their fight scenes. ‘Training for Action’ begins with Eisenberg explaining that he and Stewart prepared for the action thriller’s fight sequences by participating in a two-week boot camp before the film began shooting. The Academy Award-nominated actor added that they trained with six stunt performers and coordinators. He also revealed that the practice was so thorough that they learned fighting techniques that didn’t even end up being used in the final cut of the comedy. Stewart then emphasized that their extensive training was helpful for them both as they learned to adapt and improvise during their fight scenes. The César Award-winning actress also noted that their preparation helped them stay safe, since they were both inexperienced in such extensive fight sequences. She also revealed that despite their training, she did end up hurting herself a few times on ‘American Ultra’s set. The adventure movie was helmed by Nima Nourizadeh, who made his feature film directorial debut with the hit 2012 crime comedy, ‘Project X.’ Besides Eisenberg and Stewart, ‘American Ultra’ also stars Topher Grace, Connie Britton, Walton Goggins, John Leguizamo, Bill Pullman and Tony Hale. 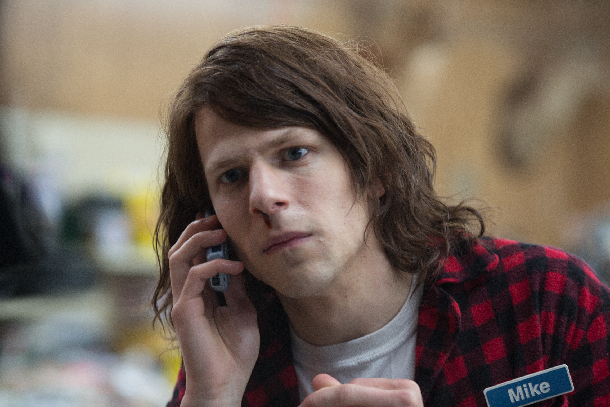 ‘American Ultra’ follows Mike (Eisenberg), who shares a small-town life with his girlfriend, Phoebe (Stewart). But Mike’s sleepy world goes wild after he discovers that he’s actually a CIA sleeper agent with lethal fighting skills-and the target of government hitmen. Mike, the ultimate slacker, transforms into an ultra-attacker as he and Phoebe fight to survive. The ‘American Ultra’ home entertainment release includes ‘Activating American Ultra,’ a behind-the-scenes documentary; ‘Assassinating on a Budget,’ a featurette that looks at the unique weapons used in the film; a gag reel and an audio commentary with Nourizadeh. The ‘American Ultra’ Blu-ray Combo Pack and DVD will be available for the suggested retail price of $29.99 and $21.98, respectively. Watch Shockya’s exclusive ‘American Ultra’ home release clip, ‘Training for Action,’ and check out images from, and the action thriller comedy’s Blu-ray and DVD covers, below.